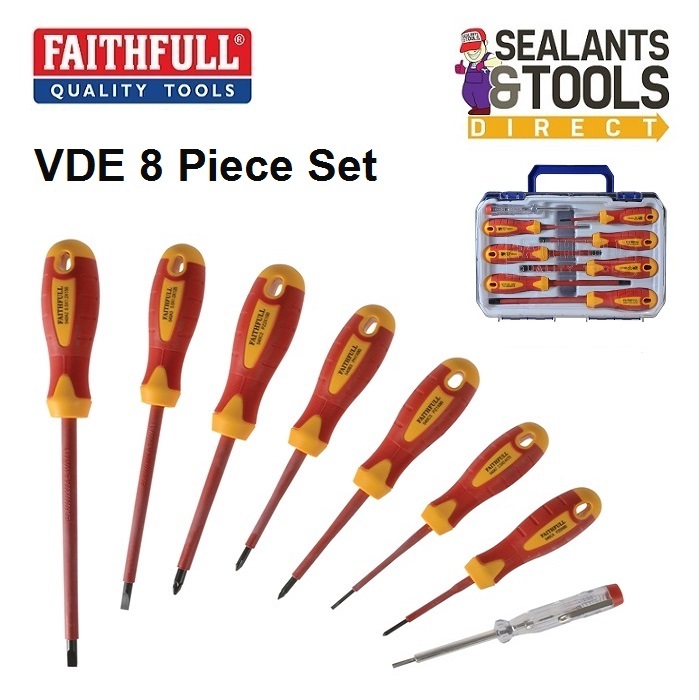 Faithfull Soft Grip VDE Screwdriver Set of 8 supplied in a plastic carry case. Faithfull VDE screwdrivers are manufactured to EN 60900:2004 and individually tested at 10,000V before leaving the factory, guaranteeing a safe working limit of up to 1,000V to provide the maximum level of safety. The screwdrivers feature a two-component, slip-resistant, soft-grip handle with high quality Chrome Vanadium steel blades correctly tempered and hardened for high torque and strength. For use on terminal blocks, control cabinets, switches relay and sockets. 3 x Slotted: 2.5 x 75mm, 5.5 x 125mm, and 6.5 x 150mm. 3 x Pozi: PZ0 x 60mm, PZ1 x 80mm, and PZ2 x 100mm. 1 x Phillips: PH1 x 80mm. 1 x Mains Tester 140mm.